It’s a really impressive piece of work and reinforces the critical place of higher education in the UK economy. The report is also accompanied by a set of more detailed reports which examine the impact of universities on the economies of the English regions. The current strength of East Midlands higher education institutions in attracting students from further afield to study in the region also means that they are attracting additional money into the region and boosting export earnings. • In 2011–12 the region’s universities attracted over 25,945 students from outside the UK. The fees paid by international students to the universities are captured in the university accounts and their impact is included in analysis of the overall institutional impact at sectoral level. (Non-EU students alone paid the universities £221 million in fee income in 2011–12.) Payments to the universities for halls of residence accommodation, or money spent in university cafeterias, bars etc are likewise captured in the institutional impact. However, in addition to any fees or other monies they pay to the university, international students spend money off-campus. This can be on private sector rental, food, entertainment, consumer goods, travel etc. 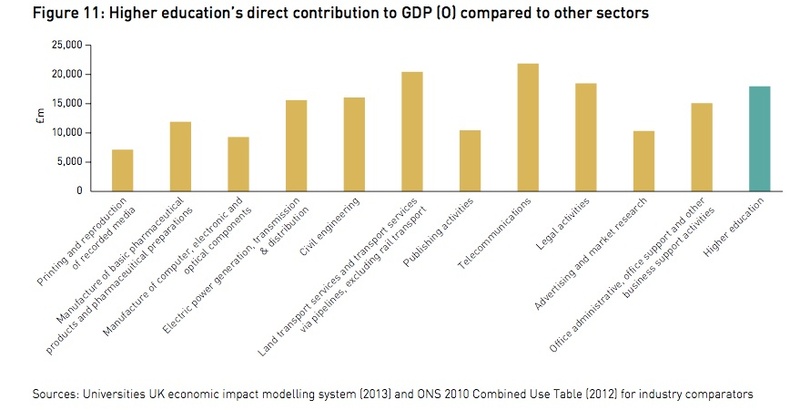 In 2011–12 this off-campus expenditure of international students was estimated as £293 million. All very helpful and interesting. This entry was posted in Admin, economics, Education, HE, University and tagged East Midlands, economics, GDP, HE, impact, universities, UUK by Paul. Bookmark the permalink.